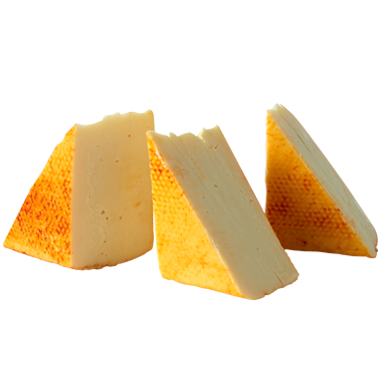 Muenster is one of our country's first semi-soft cheeses, and it originated in ancient monastic Alsace, France. It made its way to Wisconsin’s no-shortcuts, no-nonsense cheese-makers in the late 1800s. In Europe, muenster is traditionally a soft, creamy white, washed-rind cheese. In Wisconsin, it's a bit firmer, ranging from mild-to-sharp, with a bright orange, natural annatto coating. We can’t get enough of this earthy, able-bodied cheese. We’ve tried and it’s just not possible. Mild and nutty and more flavorful with age. Like a lot of fine folks we know. Firm, well-chilled blocks are easiest for slicing. Wipe your knife with a damp cloth between each slice if your Wisconsin muenster has that common bright orange, natural annatto coating because it tends to smear. Also, we recommend oiling your slicer before use. If you''''re storing muenster, place a piece of waxed paper between each slice to keep them from sticking together. Beers and wines are our go-to for Wisconsin muenster. Stouts, pilsners, pale ales, porters, brown ales, lagers and Belgian ales are all really tasty with it. If you’d rather sip on wine, we suggest chardonnay, pinot noir, merlot, red zinfandel, riesling, sauvignon blanc, beaujolais, pinot gris or gruner veltliner. We love the meltability of muenster so we recommend dressing up your grilled cheese sandwiches, cheeseburgers and rainy day sleep-late weekend scrambles with it. Also, pizza doesn't always mean mozzarella. For a Wisconsin spin on classic pie, you can’t possibly go wrong with some grated muenster with thinly sliced bratwurst.